As you may have noticed Gwendolyn is stepping down from the a2z DT. It is always hard to say Goodbye, but that’s part of life; and I believe a Goodbye is not forever. Thank you Gwendolyn for all your contributions to a2z, and for all the beautiful inspirations you’d shared. And we wish you all the best in your future endeavors!! And now, please join me and welcome a new DT member, LeeAnn McKinney. If I am home, I am in my craftroom, if I am at work, I am thinking of the projects I am going to work on when I get home. One day a week I can bring my crafty fun to work with me, and really enjoy it. Stay tuned, come back tomorrow to see LeeAnn’s first solo post here on a2z. Categories: announcement | Tags: announcement, design team | Permalink. Hello Crafty Friends – Annie here with a CAS card. I simply printed the digital download and cut the dragonfly I wanted to work with from the rest. Colored it in with some Arteza Real Brush Markers for a soft watercolor effect. Then, Fussy cut it. Next, I die cut the word LOVE twice – once from plain white cardstock one once from Rinea Ruby Glossy Foil Paper. Stack and glued the layers to create a chipboard word. I stamped the sentiment You More on white cardstock and cut it into a thin strip. I adhered all the elements on to card front panel which measures 4″ X 5-1/4″ I made from tone on tone pink pattern paper and medium gray cardstock for a nice mat. I then stamped a few hearts for a dragonfly trail. Finished it all off with some small gray and pink sequins and a bit of Wink of Stella on the wings. Rinea Ruby Glossy Foil Paper. Categories: Digital, Handmade Cards, Hero Arts | Tags: Annie Collins, DC175 Love stamp and cut set, design team, Hero Arts, Hero Arts Winged Friends, Love, Love you more, Mood Board | Permalink. Hello Crafty Friends – Annie here with this month’s theme of Winter Wonderland I wanted to have the colors of my card soft. I used soft blue and gray instead of the traditional red and green. These colors go perfect with the Polar Bear Greeting stamps in creating a winter wonderland scene. The a2z scrapbooking store carries a wide variety of Hero Arts products! Get discounted new releases, sales, grab bags & more. Proceeds from our store benefit Celiac & Behcets disease foundations. Use my discount code Annie15 to get 15% off your purchase of $25 or more. If you’re looking for a Hero Arts product you don’t see in store, use the Request Custom Order button from with-in the shop. Categories: Handmade Cards | Tags: Annie Collins, design team, Hero Arts Polar Bear Greetings, Polar bear greeting stamps, Winter 2018 | Permalink. Hello Crafty Friends – Annie here with a softer color version of Christmas colors. This month’s theme is Winter Wonderland in keeping with this I wanted to have the colors of my card soft. I used soft pink and soft green instead of the traditional red and green. These colors go perfect with the Polar Bear Greeting stamps in creating a winter wonderland scene. Categories: Handmade Cards | Tags: Annie Collins, design team, Hero Arts, Hero Arts Polar Bear greeting stamps, Polar Bears, Winter 2018 | Permalink. Hello Crafty Friends – Annie here with a card of Thanks – In keeping with our theme this month of Give Thanks. This card is perfect a simple thank you for any occasion. Thank you for stopping by today – Remember to use my discount code Annie15 to get 15% off your purchase of $25 or more. Categories: Handmade Cards | Tags: Annie Collins, design team, Hero Arts, Hero Arts Celebrate Stamp, Hero Arts Layering Bird Stamp, Thanks | Permalink. Please join me and welcome our newest DT member Christi Conley. Yay Christi, welcome aboard!! Here’s a little introduction of her. I am a mom to the Fabulous Feline Five; love to make all kinds of art, read, & sleep. I moved from the East Coast to wonderful Colorado in 2010 with my felines and family. I enjoy recycling, tag & garage sales, and creating something cool out of nothing. A few years ago I started my own blog, Art Without Anxiety, and I have been extremely fortunate to make a bunch of great friends, get on some amazing design teams, and get over my fear of sharing my creations. I truly enjoy blogging and sharing a bit of myself and my art with my readers. I don’t have a specific style or anything that particularly inspires me; I just go with the flow! I started rubber stamping and paper crafting in the early 90’s and I was absolutely hooked from day one (so hooked I signed up to be a demonstrator without ever having been to a demo, class, or anything – I found the information online and joined up!) I can’t draw a crooked line, so rubber stamps became the way I could express myself artistically, plus there is so much you can do with them! After all these years, I am still amazed when I watch embossing powder melt; the process just fascinates me! I can get bored with things fairly easily and quickly, but I am never bored when I am playing with my stamps, papers, chipboard, paints, inks, and all the other goodies this hobby has to offer. I love quotes and one of my very favorite things to do is create wall hangings, as well as mixed media and cards — well, honestly, I love it all! In addition to my blog, you can find me on Pinterest and Instagram; I’d love to have you stop by! Christi we’re glad to have you on our team, looking forward to a fun creative journey with you! And to our readers, come back tomorrow and check out Christi’s first solo post. Have a lovely day!! Categories: announcement | Tags: design team | Permalink. Hi everyone! Here’s to a new month! And that means a new challenge here at a2z Scrapbooking Blog! Our challenge this month is Frightfully Fun! Off you go to create something frightfully fun to enter October’s challenge here at A2Z Scrapbooking. We have some amazing inspiration from a few of our design team members to inspire you to play! Take a look. As you know, we’ve changed our rules a bit and participants are no longer required to use Hero Arts products to enter our challenges. 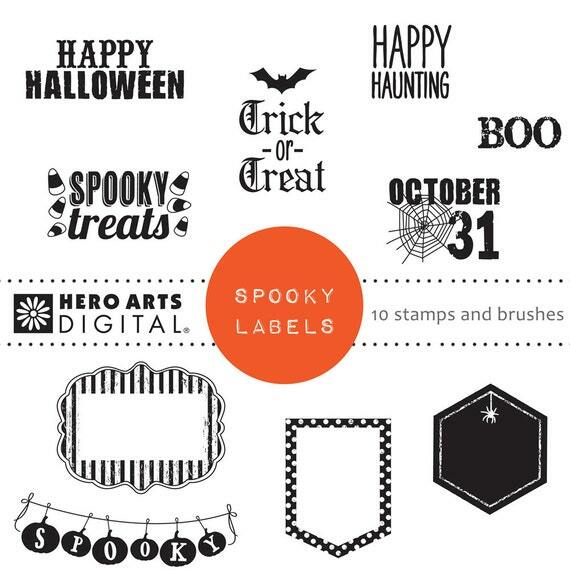 Each month we feature a ‘Digi of the Month’ which will be the prize offered to our randomly-chosen challenge winner, and this month it is the Hero Arts Spooky Label Digital Kit! Categories: Digital, Halloween, Handmade Cards, Hero Arts | Tags: 2018, a2z Scrapbooking, Annie, Arlene, birthday cards, card, Cards, Cindy, design team, digi, digi stamps, digital kit, Digital Stamps, distress oxide inks, Hero Arts, Karen, stamping | Permalink. It is always difficult to say Goodbye. Today we bid farewell to a few DT members. Delia, Niki, and Sue are stepping down from the team. Delia, Niki, Sue, we thank you for your contributions and creativities. We would miss you a lot!! Please come back to see us often. Char is also scaling down her activities with the group, although she won’t be making regular posts, she would be participating in our digi duels. Thanks Char for doing that for us. Now we would like to welcome Karen, Gwendolyn, and Annie to the team! Below is a little introduction. Please look for their first post in the coming days. Hi I’m Gwendolyn, I’m originally from Singapore but I spent more than half my life living away from home, in places like New Zealand and France, and we are now expatriates in Ulm, Germany, the birthplace of Albert Einstein! I gave up my job in the aeronautical industry 5 years ago, to follow my hubby to Germany, and now I have tons of free time to spend with our 3 teenage kids, 2 dogs and also try loads of new things. I picked up crafting a a few years ago starting with soy candle making, crochet, abstract acrylic painting… but when I discovered card making 2 years ago, I immediately became hooked on it and now I do it all the time! I’m essentially a one layer card maker who LOVES colouring. I started learning to water-colour 6 months ago and it is now my favourite medium to use, although I love my colour pencils and alcohol markers, which is a recent discovery too. Hello Friends, my name is Annie Collins and I have been crafting all my life. I started at 4 years old sewing with my mother. My passion for crafting and sharing continued to grow over the years. I love paper crafting the most – all forms of it. I live in sunny Florida with my fantastic family, husband, 3 children and pets. I can’t wait to share some projects and be inspired by all of you. Tomorrow is the beginning of a new challenge, come back and catch the details. Have a great day!! Hero Arts ‘Nicest Thoughts’ and My first post! Hello, hello, everyone! Erica here with my first post as a DT for a2z Scrapbooking Blog!! In case it isn’t abundantly clear, I’m very, very excited to be here! If you know me from my other design team blog posts for Krumspring Stamps, Studio Katia and Kennedy Grace Creations, you already know this isn’t going to be a short and sweet post. Oh no, I’m a jibber-jabbering kind of gal (that’s ‘going into lots of detail’ in Erica speak and ‘talking non-stop about everything and nothing’ in The Husband speak) however I will try and curb the enthusiasm enough to actually get to the cards I made for this, ‘my very first, in case I didn’t mention it’, post. Unfortunately I didn’t get my DT package in time to make these cards so I had to improvise with some of my other Hero Arts products but anything you see in this post can be ordered from the shop. Just pop an email across and if it can be obtained, it will. Like magic! That’s the kind of shopping I like! Anyway, I have this stamp that says ‘You are one of my nicest thoughts’ (which sadly isn’t available from neither the main Hero Arts store or the a2zScrapbooking Supplies shop) but I decided to use that for two cards anyway because the sentiment is so lovely. For the first one I dusted a rectangular panel with anti-static powder before stamping it with VersaMark ink and sprinkling generously with Hero Arts white embossing powder. I set it with my heat tool, which isn’t as fancy as this one but does the job. When I had added the colours to the word ‘NICEST’ on the image I thought it didn’t really show so much so I blended the colours out around the word, kind of like a colour shadow and was much happier with that. While I was at it, I also coloured the circle around the sentiment in a rich blue colour. While that was drying I got my Distress Inks out and decided to go hot pink for the white embossed panel. Picked Raspberry is one of my favourite colours in the Distress Ink family and I’m so excited to hear that it is going to be part of the second release of the Distress Oxide inks! Ah, but I digress… Right, it doesn’t take a rocket scientist to figure out where I was going to go next though: I blended away on the panel and kept it lighter in the middle and rich and vibrant around the edges. For my Peacock Feather Stencil background I used turquoise, lime green and teal colours, again Distress Inks, and simply blended away until the colours very nicely… erm… blended? I use painters tape when I do ink blending and water colouring to hold the paper down, it’s so cheap at hardware stores it seems crazy to splash out on ‘crafting tape’ when I use it only for this purpose. As pretty as the background was I felt it needed a little something else so I die cut the second biggest of the Outside In Stitched Rectangle stackable dies from Lawn Fawn and popped it up with foam tape (I love this stuff and can’t live without it!) After that was done it was a simple case of adding some more foam to the back of the sentiment and pop that on. I also added a healthy dose of teal sequins and gemstones for sparkles. A card with a peacock theme can’t be bland, can it now? To finish off my pink card I die cut a scalloped panel (both the die cut bits I used for this card are from Mama Elephant) in a pretty polka dot card stock and adhered that to a white card base. The embossed and ink blended panel I adhered with foam tape to raise it up and add some dimension. This card also got a serious sprinkling of sequins and gemstones, because why not? With one last picture of the Peacock card, that’s pretty much it from me for this first post. If you are still here, you deserve a big cookie! I will be back on the blog later this month with another project or two, and of course lots more jibber-jabbering. There is no getting around that, I’m afraid, lol! I hope I have inspired you to try one of these techniques or colour schemes for your next card. Don’t forget that this months challenge blog theme is ‘Anything Goes’ so go to town and let your imagination run wild! If you add your card to the InLinkz before the end of the month, you can win a $25 gift voucher to the a2z Scrapbooking shop! If you can’t wait to shop, you can get 15% off by using the discount code ‘Erica15’ at checkout. Please join us in this months “Anything Goes” challenge for your chance at a $25 gift card to the a2z store. Our current monthly challenge can always be found in the menu bar, and runs from the 1st to last day of the month. Right, that really is it from me for today. Categories: Clean and Simple, Coloring, Embossing, Friendship Cards, Handmade Cards, Hero Arts, Stencil, Watercolor | Tags: design team, die cutting, Erica, Heat Embossing, Hero Arts, ink blending, sequins | Permalink. Hi, friends, it’s Chark again today with a card and details on our Design Team Call. The birthday card I made uses washi tape and sentiment stamps. I used a white panel of cardstock and stamped the small Happy Birthday sentiment sideways to mimic candles. I added some flames with markers. I used the larger Happy Birthday sentiment as the focal point and then used three different washi tapes to add a colorful line at the top of the panel. I inked the edges of a white card with the same Strawberry ink as I used to stamp the candles. And that was it! Love this Birthday Messages stamp set, it’s got a lot of great stamps you’re sure to use. Hope you’ll join in our May Challenge Sentiment Focus and use your Hero Arts sentiment stamps as the focus of your card. Please stop by my blog Glitter In My Kitchen for some more ideas. And now, onto the Design Team Call…we’re looking for team members for the July-December 2017 term. Here are the details. Email me at a2zscrapping@gmx.com by May 31, 11:50pm EDT to be considered for the new term. To submit two projects per month showcasing Hero Arts or any other products for sale in the store. This usually includes the newer items, but can also include any of the sale items, digital items or anything a2z Scrapbooking sells. To participate in the monthly challenge on the first day of the month 2-3 times in a 6 month period, to showcase the challenge with a project that meets the requirements of the challenge. To commit to a six-month term. To comment on challenge entries monthly. To post your project (or a sneak peek) on your own blog/flickr/Instagram/facebook (if you have one) on the day your project appears and the link to the a2z blog. A 25% discount to both the a2z Scrapbooking store and on craft items (stamps, dies, paper, tools, embellishments, adhesive) from many other manufacturers (any that are available to the owner for purchase) and a 15% discount for your followers/readers to use at the a2z store. You can also earn freebies each month if you earn the top points by doing your “regular” jobs of commenting and posting, as well as by going above and beyond the basics and posting on IG, tweeting, etc. Three top team members get a fun package each month. Promotion of your blog and art and a DT blog badge. Free Hero Arts digital stamps We’re the exclusive retailer of HA digi stamps/cut files. The chance to support charities and do good in the world by creating art. A2Z is run by volunteers and was founded to aid charities that support those with Celiac and Behcet’s This business is in the business of helping people, not making a buck.To be active in promoting a2z Scrapbooking Supplies on social media sites, such as our Facebook page, flickr page, twitter etc. Cardmakers, scrapbookers, mini-album makers, mixed media artists, etc. are encouraged to apply. We welcome video or photo tutorials, and anyone from any country can apply, as long as you can write your post in English. We can look over your posts and fix anything needed, but a strong knowledge of English is required. If you’re interested in applying, you should know this team is very supportive and helpful and if life gets in your way, someone is always there to help. We do use Facebook for our team page to communicate with each other, so having a FB account is important. There is no drama in this group and a lot of talented, friendly people. To apply, send me a link to any of your social media sites (FB, IG, Twitter, flickr, blog, etc) where you post projects so we can see your style. You can also add an attachment of one or two of your favorite projects to a2zscrapping@gmx.com This is a great team to be on and a great way to build your supplies at a discount. Hope to hear from you soon! Categories: Birthday, Challenges, Handmade Cards, Hero Arts | Tags: Birthday, candles, chark, design team, Design Team call, Sentiment | Permalink.